The 1970s saw the most coherent period of experimental filmmaking yet, as festivals such as The International Festival of Independent Avant-garde film showed the extent to which artists across Europe and North America were working with film and saw themselves as an art form separate from the mainstream cinema market. The latter part of the 1970s saw the emergence of a new moving image medium, video. Written and researched by Lucy Reynolds, Luxonline Content Manager and Russell Hedges, writer and PHD student at the University of East London. Experimental Cinema, a fifty-year evoloution by David Curtis is published by Studio Vista. Ten TV Interruptions by David Hall broadcast unannounced on Scottish TV. Reel Time performed by Annabel Nicolson at the London Film-makers' Co-operative. The International Festival of Independent Avant-Garde Film at the National Film Theatre. Fifth Experimental International Film Festival, Knokke-Heist, Belgium includes video works for the first time. Fantasy Factory set up in London as an independent video editing resource for community groups, community arts projects and artists. 2B Butlers Wharf is set up to present video, film and performance work on a regular basis until its closure in 1979. Avant-garde British Landscape Films at the Tate Gallery. The Video Show, Serpentine Gallery, London. London Video Arts (LVA) is founded for the promotion, distribution and exhibition of video art. Artists' Video - An Alternative Use of The Medium, The Galleries, Washington Tyne and Wear. Ayton Basement – opens in Newcastle Upon Tyne, December, 1976. BBC TV Arena video arts special. First British TV programme opens, unannounced, with This is a Television Receiver by David Hall. The Video Show, Tate Gallery, London. First Tate Gallery exhibition of video installations. Video Manifestatie, Bonnefantenmuseum, Maastricht. International exhibition and symposium includes work by British artists. British Film and Video at the Cavallino Gallery, Venice and Bon a Tirer Gallery, Milan, Italy. Documenta 6, Kassel, Germany. British Video represented by David Hall. Dixieme Biennale de Paris. British video installations by Tamra Krikorian, Stuart Marshall and Steve Partridge. Video Art 78, Herbert Art Gallery and Museum, Coventry. LVAs first screening, Air Gallery, London, also launches its first distribution catalogue. Circles formed to distribute women artists' film and video. 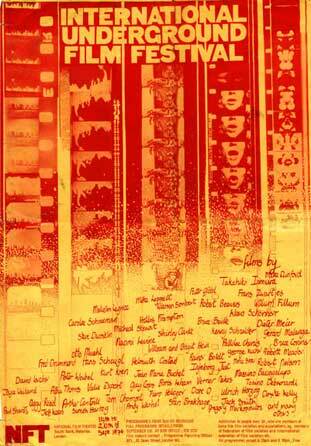 Videotapes by British Artists, The Kitchen, New York, selected by Steve Partridge.